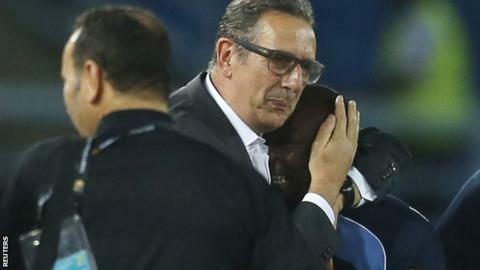 DR Congo coach Florent Ibenge and his Tunisia counterpart Georges Leekens were unconcerned about how their sides made Africa Cup of Nations progress. Both teams reached the last eight after their 1-1 draw - with DR Congo pipping Cape Verde, who drew with Zambia, to qualification on goals scored. Ibenge said: "We have qualified for the quarter-finals with some difficulty." Leekens said: "We know we are not the best or the most beautiful but we have qualified and I am very happy." DR Congo secured their place in the quarter-finals after scoring two goals in their three Group B matches - including Jeremy Bokila's 66th-minute effort against Tunisia - while Cape Verde only found the net once. Their next opponents are Congo on Saturday afternoon and Ibenge added: "We have not qualified for this stage since 2006 so this is great for us. "Congo will be tough opponents with an established coach. It will be more than a derby and it will be very difficult for us, and hopefully for them too. "But we won't look any further ahead, only teams like Algeria and Tunisia can do that." Captain Youssouf Mulumbu, who was unable to play for the Leopards on Monday because of injury, said: "It is a fantastic feeling. We worked for it and we deserved it. But we need to score goals and were lucky because Cape Verde and Zambia only drew. "Qualification for the tournament too was difficult because we were in the same group with the Ivory Coast and Cameroon. "But it would have been a big loss had we not qualified from this group." Tunisia's reward for progressing is a meeting with tournament hosts Equatorial Guinea on Saturday night. "We were fantastic in the first half. We wanted to score the second goal and we had three, four or five chances to do so," said Leekens. "In the second half, the spaces opened up because the Congolese were taking risks and fatigue was setting in. "Tunisia are happy, Congo are happy, Equatorial Guinea are happy, everyone is happy. Life is great." Looking ahead to the weekend, Leekens added: "We saw their match on Sunday, the joy and we heard the car horns. "They have a balanced team with a lot of pace up front. It won't be easy because they were fantastic on Sunday. I am happy for the country but now we want to qualify. "It will be difficult because they will have the fans behind them but I am quite confident. I try to be positive in any circumstance."